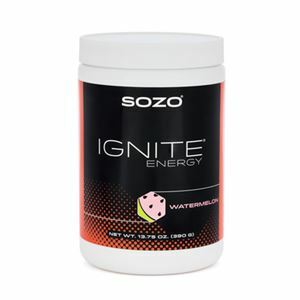 SOZO Ignite® Watermelon Powder Energy Drink is a powerful nutrient mix that has more than 18 vitamins, minerals and nutrients that work synergistically to provide an effective and clean source of energy. This powerful blend provides more than 100% of the USDA daily requirements for many vitamins and nutrients. SOZO Ignite® contains an effective amount of caffeine, Taurine, and energizing B vitamins to support optimal energy levels. Ingredients: vitamin A, vitamin C, vitamin E, thiamin, riboflavin, niacin, vitamin B6, vitamin B12, pantothenic acid, zinc, choline dihydrogen citrate, choline bitartrate, L-tyrosine, citric acid, L-taurine, caffeine, glycine, GABA, L-carnitine, L-tartrate, ribonucleic acid, co-enzyme Q10, maltodextrin, natural and artificial flavors, beet juice, sucralose, silica, mono and diglyceride fatty acids.